I know this is a couple months late. I haven’t been keeping up on this blog the last couple of months. Life has gotten busy. Summer I just busy as I’m sure you all know. Anyway, my mother in law came down the weekend before I headed to freewheel. She watched my kids while I rode and my husband worked. I am so thankful for her. Tuesday my husband and I drove a rental car to Owasso, OK. We went to a friends house to pick up our truck. After lunch we took the rental car back to the airport. Then we went back up to Owasso and met my friend at her house. At this point I said good bye to my husband and daughter. My friends husband drove us to our first stop, Paul’s Valley. We decided to spend the night in our tent at the first town. We set up the tent and then hung out charging our phones and blowing up our mattresses. Wednesday morning we rode from Paul’s Valley, Oklahoma to McLoud. It was about 60 miles. It was a beautiful day and a great ride. In McLoud we set up camp only to take it back down again in the evening. A storm was heading our way and it was supposed to be a big one. Local churches opened their doors to those of us that couldn’t fit in the school already letting people sleep in the gym. So we moved our stuff to the church closest to headquarters and went to bed. My friend would not be continuing on with me. She had hurt her knee a couple weeks before freewheel and after 60 miles her knee was really hurting. The church we slept in wasn’t completely full when we went to bed but when I woke in the morning there were more people. The tent guy had his people take down his tents but then didn’t get done til after midnight. I heard that he lost a few tents to the storm. Thursday morning I packed up as quietly as I could so I wouldn’t wake the other people in the room. I was a bit nervous for today. Last year my friend and I rode the whole thing together but today I was on my own. Not really on my own. If you have ever done freewheel you know that you are never on your own. In fact yesterday we ran into a friend from Owasso who had moved the year before but came back for Freewheel with some of his friends. I got my stuff loaded after I said goodbye to my friend. Her daughter was coming to pick her up but wouldn’t be there for a couple more hours. A nice random lady gave me water from her own cooler since I couldn’t find any water. Then I took off. It was kind of cloudy and threatened to rain but it didn’t. Today I rode to Stillwater, Oklahoma. It was about 71 miles. It was a long day. My rear end hurt but I made it and in good time. I made some fun friends a long the way as we played leap frog throughout the day. I got into camp and decided to set up my tent with the other tents. Normally we set up as far away from everyone else as we can but since I was now on my own I felt safer camping with the group. After my shower I was sitting in my tent and other campers started setting up next to me and we all started talking and joking around. I made friends with a father daughter group next to me. We ate dinner together and then we all walked downtown to watch the bike races. It was good to be with others. He even explained the rules of the race to me. We even watched one cyclist get run over by another. Thankfully they both walked away from it. I went to bed early. Friday I woke at 5 in order to get on the road by 6. I was hoping to get to Tonkawa before the heat of the day sapped my energy. It was another 70 miles. It was another good ride. I was feeling much more comfortable riding without my friend. I had made several friends yesterday and was having a blast. I met friends in Tonkawa again and hung out with them. The dinner was great but the talent show afterwards was so much fun. I again hit the hay early. Saturday I again woke up at 5 but hit snooze. My husband called me around 5:30 to let me know that they were on the road headed my way. They had a 7 1/2 hour drive to meet me in Caldwell, Kansas. So I got up and broke camp. I had plenty of time since today I only had 42 miles to go. I again didn’t want to be riding in the heat of the day. I made it to Caldwell in good time but had no service at all. Come to find out that At&t doesn’t have service in Caldwell so all of us who used At&T towers didn’t have service. I nice lady let me barrow her phone to call my husband and let him know that I made it. I took my last shower on the shower truck and then gathered my stuff to one location to wait. The baggage truck still hadn’t shown up yet. When it finally did the people who were supposed to unload it never arrived. So we got permission from the driver and had the truck unloaded in no time. I visited some more with other riders and watched as people took their bikes apart and put them in boxes before loading them on the truck to be hauled back to Tulsa, Oklahoma or back to the boarder where the ride started. I started to worry about my family but they eventually got there. It was an awesome ride and I loved every minute of it. I made some great friends and I hope to do it again next year. 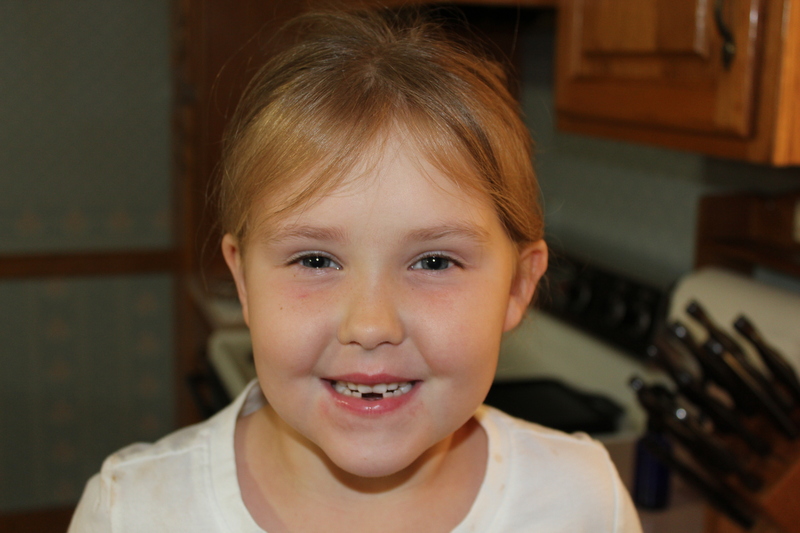 This is our oldest child and she has had two very loose teeth for quite a while. When they were first loose she wanted us to pull them every day. We kept telling her that they weren’t ready. Then they got more and more loose and every night for almost a week she asked us to pull them so my husband worked on them a little each night. They started hurting so she finally stopped asking. Well Friday night they were really loose. She could almost push them out of her mouth with her tongue. So after an hour of working with her to keep her mouth open and tongue off of the teeth we finally got the first one out. My husband finally just grabbed the tooth with the paper towel to keep it dry and as it started to hurt she jerked her head back and the tooth stayed with him. She was upset because it hurt and she kept going on and on until she looked at her dad and realized that he was holding her tooth. She was so excited. She was also done. She decided that she wanted to wait for a few days to get the other tooth out. The thing is, is that her other tooth was more loose than the first one. We could actually see the big tooth had broken through the skin already. With the first tooth missing the second tooth was practically already out. So after another hour of talking her into letting dad pull the second one she braved up and was sitting on my lap so dad could pull the second tooth. Same thing. He used a paper towel and a she thought it started to hurt she pulled away leaving the tooth in dad’s hand. So now she is the bravest and coolest girl because she had both teeth pulled in one night. Like any kid she was very glad for the tooth fairy to come. Yesterday I was looking up cross state rides like the Oklahoma Freewheel. I happened across a ride where the length is 300 miles….In 1 day. I thought it looked awesome. I mentioned it to a few family members and the common response was that I was crazy. I think it would be fun. I’ve done one century ride and 4 days worth of the Oklahoma freewheel. I love the long distance rides. My brother told me I was crazy vet to go for it. My husband didn’t tell me not to just that I’d have to keep a constant. Drain speed in order to make it. I’m pretty sure I’ll need at least a year to train so it isn’t going to happen this year but I’m hoping that next year I can enter and finish the race. I’m excited. The only question I have is how do I train for something this long?